Food as fuel – and a component of health – gets another advocate next month with a new cookbook from Rodale Books, the folks who do Prevention and a host of other published products geared toward healthy eating and living. Foods rich in micronutrients, essential protein, fiber, the right carbohydrates, easy preparations, and more ─ these are the essentials in Dana Jacobi’s new book "The Essential Best Foods Cookbook" (May 2008; Rodale Books; Paperback; $23.95; 32 full-color potos). Jacobi has written six cookbooks and written for Food & Wine, Cooking Light, and the New York Times. Her work has won a Gourmand World Cookbook Award and has been twice nominated for a James Beard Foundation Book Award. She teaches cooking classes in New York City, where she lives. 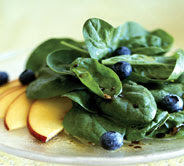 Building on the repertoire she presented in “12 Best Foods Cookbook,” which presented the spinach and fruit salad (right), Jacobi expands her list to 61 superfoods and creates 225 easy recipes that incorporate those ingredients. One element to this book: Jacobi explains the science and theory behind why these foods are “essentials” to daily living. The recipes – from tomato soup to Waldorf salad – appear to be fairly mainstream, with healthier variations giving them a twist. Many “health” food cookbooks can’t say that. The recipes feature tips, including basic techniques for grilling, baking, pan-searing, and poaching, and serving alternatives. And since lack of time frequently challenges those who want to eat more healthfully, many recipes are ready in 30 minutes or less. For the marinade: In a 1-gallon resealable plastic bag, combine the wine, lemon juice, soy sauce and pepper and shake to combine. Add the 2 tablespoons oil and set aside. For the meat and stuffing: Place the meat on a work surface with a short end facing you. Using a long, thin knife, cut the meat in half horizontally from side to side, stopping about 1/2 inch short of the second side so that you can open the cut steak like a book. Place the opened steak in the bag with the marinade, seal and refrigerate for 1 hour, turning once. Preheat a gas or charcoal grill to medium. If using charcoal, mound the briquettes toward one side of the grill. Place the garlic on a cutting board. With a heavy knife, chop and smear it to a paste. Place the garlic paste in a small bowl and add the parsley, thyme, lemon zest, salt, pepper and 1 tablespoon oil. Remove the steak from the marinade and pat dry. Discard the marinade. Lay the meat on a work surface so what was the seam lies horizontally and the grain of the meat runs from left to right. Cover the meat with the filling, leaving a 1-inch border at the top. Sprinkle on the goat cheese. Working from the bottom, roll the steak up like a jelly roll. Thread toothpicks along the edge to seal the roll closed. Grill the meat over direct heat, turning it every 3 minutes to brown it on all sides, for 9 minutes in all. If using a gas grill, turn off the center row burners. If using charcoal, move the meat to the cooler side of the grill. Cover and grill the meat over indirect heat, starting to check at 8 minutes and removing the steak when a thermometer inserted in the center registers 130 degrees for medium-rare or 140 degrees for medium. Let the steak stand for 10 minutes, then cut crosswise into slices.